Compare Specialist Ski and Snowboarding Insurance. Winter sports option can be added to annual policies for up to 24 days cover. Whilst insurance policies found on the MoneyMaxim travel insurance comparison service will be suitable for most recreational skiers and boarders, if you are getting really serious you might find you need specialist cover. To the left is our directory of some of the companies we feel go beyond the norm and are worth considering for those who find standard policies are lacking. Term of Cover - Most standard insurers limit the number of days they cover skiing and boarding to a week or two. If you are expecting to be away longer, look out for insurers who provide longer term cover. 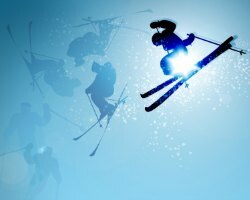 Those who automatically include it tend to be the best value as they will be insuring many policyholders who will not use the extended winter sports cover at all and so will be spreading the ski and snowboarding risk thinner - which normally means lower premiums for those who do actually use the cover. Ski and Snowboard Cover - If you have expensive skis, snowboards or boots you often find standard ski or board insurance is limited when it comes to the cover it provides. Also, there are often restrictions on cover when they are left, for example, outside mountain restaurants. Better quality insurance can provide cover up to say £1000 per person. Off Piste, Park, and other activities - Standard policies tend to be restrictive when it comes to activities beyond on piste skiing or boarding, or limited off piste skiing (normally a guide is required to be in attendance). As one of the pleasures of a winter holiday is the chance to toboggan, skate, heli ski or have a trip on a piste basher, you might want a policy that will cover your holiday plans rather than restrict your activities. This list of companies was drawn up with the kind assistance of various snowheads who share their opinions at www.snowheads.com and team members from Where to Ski and Snowboard - www.wtss.co.uk. MoneyMaxim thank them all for their contributions.